For the first time in history, it is now within our reach to eradicate world poverty and the suffering it brings. Yet around the world, a billion people struggle to live each day on less than many of us pay for bottled water. And though the number of deaths attributable to poverty worldwide has fallen dramatically in the past half-century, nearly ten million children still die unnecessarily each year. The people of the developed world face a profound choice: If we are not to turn our backs on a fifth of the world&#8217;s population, we must become part of the solution. 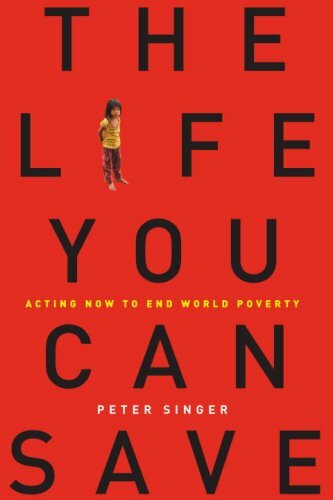 In The Life You Can Save, philosopher Peter Singer, named one of &#8220;The 100 Most Influential People in the World&#8221; by Time magazine, uses ethical arguments, provocative thought experiments, illuminating examples, and case studies of charitable giving to show that our current response to world poverty is not only insufficient but ethically indefensible. Singer contends that we need to change our views of what is involved in living an ethical life. To help us play our part in bringing about that change, he offers a seven-point plan that mixes personal philanthropy (figuring how much to give and how best to give it), local activism (spreading the word in your community), and political awareness (contacting your representatives to ensure that your nation&#8217;s foreign aid is really directed to the world&#8217;s poorest people). In The Life You Can Save, Singer makes the irrefutable argument that giving will make a huge difference in the lives of others, without diminishing the quality of our own. This book is an urgent call to action and a hopeful primer on the power of compassion, when mixed with rigorous investigation and careful reasoning, to lift others out of despair. fashion industry tome. On one page he suggests that Americans should worry less about saving money for retirement accounts and instead send more money overseas to the third world. As a Princeton Professor and expert on Bioethics, Singer is an excellent writer, does a terrific job of presenting his logical arguments, and can probably rationalize and spin almost any subject. He would make a wonderful lawyer with his ability to build a case on either side of an issue. For example, some of his other well-known theories include the government terminating the unborn and even handicapped children up to toddler age. Likewise, he supports the idea of a government's right to terminate health care for the elderly in order to speed along nature's natural course and avoid the huge costs in treasure and emotion that often prolongs the life of the terminally ill.
believer in the United Nations being able to efficiently accomplish even the simplest of tasks. Much of the billions of dollars sent to the Far East after the massive tusami disappeared in route. The bigger the institution handling the delivery of services to the poor of the world, the greater the opportunity for others to grab the cash or supplies. The best charities are indeed the smaller private ones such as Oxfam. Singer devotes a lot of time to this subject and admits how difficult it is to determine how much good any single charity actually does--even for the charity. Not surprisingly, one of the most productive programs is "microfinancing" which is a purely capitalist idea. Another very productive program is well drilling. Supplying safe drinking water to a village saves both lives and valuable time that can then be devoted to things like education. Individuals wishing to contribute more to aid the poor and sick need to carefully check out their charities. Too many charities are only fronts for wholesale theft. He also points out that even if there is no proof that any particular charity project is working, if the donators can afford it, it may still be worth supporting just in case it does work. I disagreed strongly with that theory. Donate the money to those charities who definitely make a difference if you can pinpoint them. Judging from this book, Singer is indeed sincere in his beliefs that the wealthier nations of the world can do much more for the less fortunate. He's right, but accomplishing that is much easier said than done. Singer is a brilliant man and even a cynic like me finds merit in some of his theories especially the ones put forth in this book. However, an adult being allowed to legally commit suicide is one thing. Having doctors and government make that decision is something else. This is one guy this reviewer would not like to see anywhere near the government's retirement, tax or health care systems. Obviously you can greatly cut the cost of medical care by aborting or killing every handicapped baby or toddler. Ditto for rationing the life saving health care to the elderly and that would also contribute to saving the Social Security System. Why keep supporting unproductive people who are no longer working and contributing to society with their money and labor? How long after that happens to the elderly do the standards change to apply to younger unproductive workers? in the USA should not value their own children over any other child growing up in the third and fourth world. He attempts to shame the citizens of wealthier nations into giving a "Fair Share" of their wealth (the 50% club, 10%, 5%, 1%, "5.10.5.10 formula," or as much as humanly possible and even one kidney donated to a stranger depending on the individual donors ability) because our children are no more important than the poorest child on the planet. He is constantly drawing pictures of the heroic parent who sacrifice their own children in order to save many others. He wants the village saved at the cost of the individual, although he does point out that in communes "like the Israeli kibbutzim" where kids and their parents were separated, it didn't work and parents were reunited with their children and the nuclear family restored. He uses the "selfless" actions of Abraham and King Agamemnon to illustrate the need to sacrifice one's children for the greater good (as dictated by their individual gods). I suppose that if one is regularly in two-way conversations with God, that's logical? This volume is definitely worth reading and studying, but it's also a little scary. The reason I read this book was because of the radio interview I heard with the author and like Saul Alinsky's "Rules For Radicals" this book may provide a peek into the philosophy of our new President. Hopefully President Obama doesn't condone Singer's more radical philosophies although some of his actions would strongly suggest otherwise. Obama's most (in)famous vote in the Illinois Legislature was for infanticide. The only legislation bearing his name from during his short time as a U.S. Senator was to have the USA taxpayers annually send a percentage of the nation's Gross National Product to the third world to fight poverty and disease--this above and in addition to the current Foreign Aid Programs. That would continue forever. Never mind that in order to send this money to the third world, the U.S. taxpayers would have to borrow the money to send overseas. Never mind that most foreign aid sent to the third world ends up in the pockets of corrupt government officials or the middle-men in the transfer. Many of the world's poorest nations have governments who simply don't want to help many of their citizens either for political, tribal or religious reasons. Some of Mr. Singer's theories also seem much too Utopian to actually work. His aid-to-poverty highway project seems littered with good intentions. This is an interesting read because Dr. Singer is a very influential advocate of infanticide, euthanasia and animal rights among other subjects. He was named one of the Most Influential 100 Men in the World by "Time" Magazine. One does have to read between the lines of this book. Much is hinted at, but not spelled out. One has to know something about Mr. Singer's other beliefs to detect some of those ideas bubbling up between the lines. But so long as his ideas about fighting world-wide poverty and disease remain voluntary and not required by law, Singer philosophies are worth studying and following on an individual basis. The need is certainly there and all too real. It seems logical that anyone following some of the suggestions in this "guide book to giving" would certainly make a difference to the survival and health of the poorest of the poor. In high school philosophy, we read Singer's brief article that has been called the "Singer Solution to Poverty," (actually entitled "Famine, Affluence, and Morality"). I first read it in 2001 but he authored it in 1971. It changed the way I think of poverty. "The Life You Can Save" is an extrapolation of the above-mentioned argument, and a response to the critics who dismissed his 1971 argument as unfair, unrealistic or simply unnecessary. His credentials: Singer has been lecturing, writing and researching world poverty for more than 30 years, and, as with his 30-year study and defense of animal rights, Singer is able to convince most any reasonable critic that his positions have unassailable merit. You can simplify this book's thesis by saying that if you fail to share the part of your income that is beyond what you need for a comfortable life, then that failure to share is a moral wrongdoing. In other words, if you can meet all of your shelter, food, education, transportation and other practical needs with $200 weekly, then any additional dollars you make above $200 should be given to responsible charities like Oxfam or to low-interest micro-lending institutions like Yunus's Grameen Bank. So, whom do you share your money with? With what Singer calls the "extreme poor"-- those with little access to food or clean water, health care, education, protection from guerrilla warfare, etc. (Check out sites like Give Well and Charity Navigator to help determine which groups make the most of your money.) This is in contrast to Europe's and North America's "relative poor" who are hard-off, but still usually have shelter and clean water/food. One way I like to describe his thesis is as a `redefinition of luxury.' We may think mostly of sports cars, jewelry, iPods, plasma TVs and the like as the only luxuries, but as Singer points out, if you're drinking bottled water while you read this even though you have access to clean tap water then you are spending money on at least one thing you don't need. That said, no one, not Singer or anyone else, would argue that money solves all problems. What does help is a cultural mind-shift. If we consume fewer luxuries, we are better off, and if we share our extra wealth with organizations that feed, shelter and medicate the poor, then we are also better off, globally. In this case, money can help get things going, but it's not a panacea; our actions will change the world, not just our cash. Of course, you can spend locally as well. I prefer to donate time and labor to causes like homelessness and such, because your money gets stretched much farther in Haiti or Cameroon through Oxfam than it does in the U.S. I also think it's worth considering that U.S. shelters do get some gov't assistance from HUD and other sources, whereas a village in Belize probably doesn't get any grants at all. It's important to understand that this isn't a guilt-focused book. If I teach my children that they ought to refrain from littering, I am not trying to guilt-trip them into environmental stewardship. It's an examination of the consequences of our actions and non-actions. If, eventually, we agree to accept a lesser degree of entertainment and comfort in order to "make poverty history," then nearly everyone will enjoy a greater quality of life. Examples: Think of the multibillion-dollar monument New York wants to build to memorialize 9/11 victims, or war monuments or on parades and athletic events. Or the billions we spend sending rockets and satellites to outer space. Or the $5 billion spent on the 2008 election cycle. Is it possible that money for monuments, fountains, statues, public art sculptures, trips to Mars, the Moon, elections, luxurious political and celebrity parties, etc. could better be spent taking care of our world's poor? A final thought: you don't need to buy this $14 book either. Better to rent it from your library and give the $14 to an impoverished person. Or if you do buy it, share it with at least 10 other people before donating it to a library that doesn't have it. A brilliant work of philosophy that everyone should read! 1.) "Suffering and death from lack of food, shelter and medical care are bad." 2.) "If it is in your power to prevent something bad from happening, without sacrificing anything nearly as important, it is wrong not to do so." 3.) "By donating to aid agencies, you can prevent suffering and death from lack of food, shelter and medical care, without sacrificing anything nearly as important." Conclusion - "Therefore, if you do not donate to aid agencies, you are doing something wrong." This argument is valid, and I think sound, so if one is to reject the conclusion, one MUST reject one (or more) of the premises. If they accept the premises, then they MUST accept the conclusion. Singer's goal in this book is undoubtedly worthy: helping the poor is a great thing to do, and as usual he musters arguments ranging from the philosophical to the economic to urge people to reconsider how they live and where they put their money. As I read it, tho', I found it hard to get past his decision to pit "Americans" (as a whole, all of us, who should give) against those who live in extreme poverty (who are the putative recipients, altho' that wavers a bit as the book goes on). Singer explains that even poor people in America aren't really poor, since some of them own cars (ignoring the fact that lack of public transport makes this an absolute necessity for the working poor in many cities, Detroit being an obvious example), and I was stunned by his off-hand assertions that "All Americans have access to health care" (check out Frontline's 'Sick Across America' for a different viewpoint) and that all Americans can safely drink out of the tap (check out Frontline, again, on the Potomac & endocrine disruptors). He condemns Americans for being the most generous nation in terms of individual contributions to charity, pointing out that much of it stays in America rather than reaching those in extreme poverty in other countries, and criticizes the fact that Americans gave more to Katrina victims than to victims of the tsunami, despite the fact that the Katrina folks "had the federal government to help them." This antagonistic approach was offputting to me, and, frankly, a little weird. Does he really think we have universal health care? Is he that blind to the health conditions of America's poor? How is it wrong to give to someone in your own community who is hungry, or whose kids are hungry-- even if they own a car--rather than to Singer's chosen target group? It was an odd focus for the book, and since he doesn't reveal until the end that the "Americans" he's actually talking about are the six-figure salary folks, I just kept asking mental questions about whether he had ever left Princeton long enough to talk to some of the American poor. Yes, they make more than $1.25 a day. But if he's right that alleviating poverty is a good, than why is it better to do it for some people than others? Moreover, Singer roundly condemns Western governments for a lot of choices, including some that are a little questionable. True, for example, Western governments benefit off mining in the Democratic Republic of the Congo... but that does not mean they alone are responsible for the depths of poverty there. Money is pouring into the DRC as well as Western govts. from the mining, but it's all ending up in the hands of the govt. and corrupt administrators. See Tim Butcher's wonderful Blood River for a far better informed and more nuanced understanding of the problem than Singer offers: as Butcher says, putting more money into the DRC won't lift any African (not in the govt.) out of poverty unless the system within the country changes. Singer doesn't deal with any aspect of this, however: that so many people in extreme poverty are there partly because of choices made by their govts, countrymen, and, in the case of young girls suffering from fistulas, families. He doesn't explain how giving up your retirement to pour money into such countries will actually help fix these problems. And in his many analyses of why Americans give at home rather than abroad, he never once touches on the fact that many people understand that giving locally lets them see where the money goes, rather than helping buy a satellite dish for another govt official in Kinshasa. Finally, I was mystified by his impression that Social Security appears from thin air; he seems to be one of those folks who believes that you get the actual money back that you paid in, rather than it being a rolling system where today's workers are supporting today's retirees. (He'll be getting a pension from Princeton, so he's set.) He thus cheerfully asserts that saving for retirement rather than giving it away today to help people in other countries is wrong, without asking who will then pay for the retirement (the retiree's children? the system? if the retirees' children, then won't they be giving money to an American that they should be spending on the extreme poor overseas?) and gives an example of one of his ideals, a man who gave away his cash and lives off SSecurity (and now qualifies for Medicaid etc.) Should people be giving money to overseas aid and then letting the system support them? Again, that's not a question that seems to interest Singer. From the reviews here, you can see how many people found this book a compelling wake-up call. I think I might have been more open if he had been less antagonistic, and if he had considered that American poverty is poverty too, rather than condemning the entire population in a big lump group. As it was, I wish he'd mixed his philosophy with a little more nuance and, when it comes to things like health care, actual information. I had to keep reminding myself when I read this that he is, by all accounts, a brilliant man. Those in poverty need an advocate-- but, I think, a better reasoned book than this one.